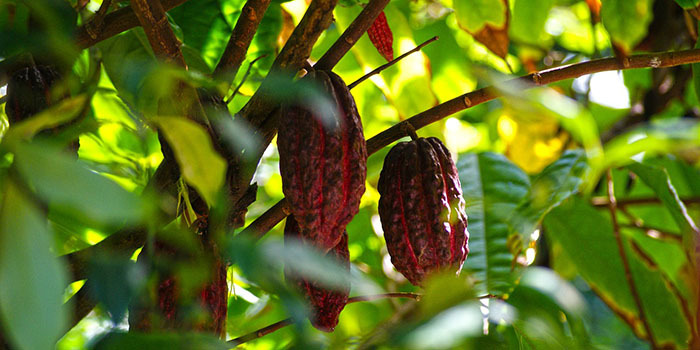 The cacao or cocoa tree is one of the most important trees of the modern industrial world. After all, this natural resource forms the foundation of a hundred-billion-dollar chocolate industry that, on the other hand, supports 3.5 million people in West Africa and provides considerable economic revenues in countries such as Belgium, Switzerland, and the United Kingdom. For starters, the cacao tree or Theobroma cacao is an evergreen tree in the family Malvacea, native to the deep tropical regions of Central and South America. Its economic importance has led to its widespread cultivation across the globe, especially in African countries such as Ivory Coast, Ghana, and Nigeria, as well as in Southeast Asian countries including Malaysia, Indonesia, and the Philippines. Chocolate comes from the cocoa bean or the dried and fully fermented fatty seed of the cocoa pod. While chocolate might seem easy to produce due to abundance of varied chocolate-based products in the market, the truth is, challenges prevail within the cacao farming industry. The cacao tree is a tropical plant. This means that it only thrives in climates that alternate between hot and rainy weathers. Furthermore, this means cacao tree can only be cultivated in regions near the equator. Apart from its natural climatic preference, the cacao tree is somehow delicate to maintain. According to the World Agroforestry Centre, the tree needs to be sheltered from direct sun and wind. Thus, it is a common practice for cacao farmers to plant cacao trees under a canopy of shade or taller mother trees or plants such as banana, coconut, and rubber. A fully grown cacao tree can still survive under direct sunlight. However, it grows best on small plots of land and under partial shades. The World Agroforestry Centre added that long-term exposure to direct sunlight stresses a cacao tree resulting in poor yield productivity. Harvesting also takes time. After planting the seedlings in prepared lands, it would take 3 to 5 years before cacao trees could produce yields. A fully grown tree can produce 20 to 30 cocoa pods within two harvests a year and it will remain productive for about 25 years. It would require a sizeable cacao planation to achieve commercial productivity. After all, the entire whole-year harvests from a single tree can only produce a measly 450 grams of chocolate. The Witches’ Broom disease caused by the fungus Moniliophthora perniciosa has affected Bahia in Brazil, decreasing output by 70% within a 10-year period. Frosty Pod Rot is another disease caused by the fungus Moniliophthora roreri that has affected Latin America and has resulted in significant output reduction, with other communities abandoning their cacao farms. Insects can also stun growth and thwart off yields from a cacao tree when left untreated. For instance, the cocoa mirids can reduce yields in a cacao farm by as high as 75%. The Cocoa Pod Borer or Cocoa Moth, on the other hand, has resulted in a yearly loss amounting to $40 million since its spread in 2000. Reports about looming shortage in cocoa supply are persistent. There are several reasons to say so. Apart from natural environmental hurdles in cacao farming, sustainability has been a critical factor to look at. As mentioned by ICCO, a cacao tree can produce yields for about 25 years. According to a report from The Guardian, the trees planted in Ivory Coast, the largest producer of cacao beans in the world, have already reached old age. Coupled with strenuous farming and harvesting processes, some farmers are planning to abandon cacao for a more economically viable produce such as rubber. There is also the use of unsustainable farming practices. According to World Agroforestry Centre, in an attempt to boost production output, farmers have grown their farms far too expansive. This large-scale farming results in several problems in the long-run. First, expansive farms meant planting cacao trees closer together. This hastens disease outbreaks as parasites and pests can spread easily. Second, cacao trees require a considerable amount of nutrition. Large and crowded farms easily deplete soils of nutrients. While farmers may depend on costly fertilisers, depleted soils would make the entire farmland unproductive and barren in the long run. Unsustainable cacao farming also creates various environmental offshoots. Apart from soil nutrition depletion, farming has reduced forestlands, affected biodiversity, and increased susceptibility to large-scale chemical contamination due to fertiliser use. It is troubling to note that although the cacao tree is the foundation of a multibillion dollar global industry, most cacao farmers remain poor. The Huffington Post featured a story of cacao farmers in Ivory Coast who, after planting cacao trees and harvesting cacao beans for decades, never had a taste of a chocolate; of course, not until a team from Metropolis TV handed them the finished product for the first time. One farmer even said that he did not have any idea what others make from cocoa beans. Cocoa tree farmers are at the very bottom of the entire chocolate industry. According to a CNN explanatory report, intermediaries such as traders, processors, exporters, and manufacturers have pushed this people below the global supply chain. Thus, they have little bargaining power and are recipient of the lowest amount of industry profits. Another troubling fact is that a particular farmer in Ivory Coast only earns around $8 a day. This farmer has to divide this earning among his family and his labourers. This amount is a far cry from an actual price of a chocolate bar. There is also the issue of child labor prevailing in the cacao faming industry. The industry has a century-long record of forced labor and child exploitation according to the International Labor Rights Forum. Because of low income, farmers could not afford the needed number of labourers, thus compelling them to tap children from their communities or through trafficking as labourers. When in these farms, these children are exposed to chemicals and long working hours. Farmers are also growing old. In the same CNN report, offspring of these farmers share an unfavourable perception toward cacao farming. They’d rather plant and grow another produce such as rubber or go to metropolis to look for a more viable economic opportunity.